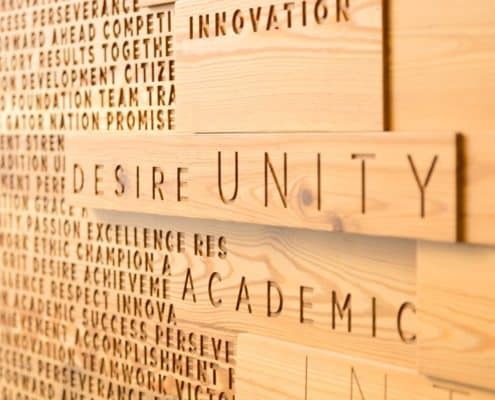 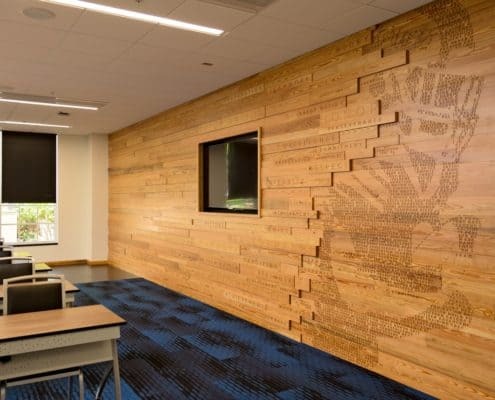 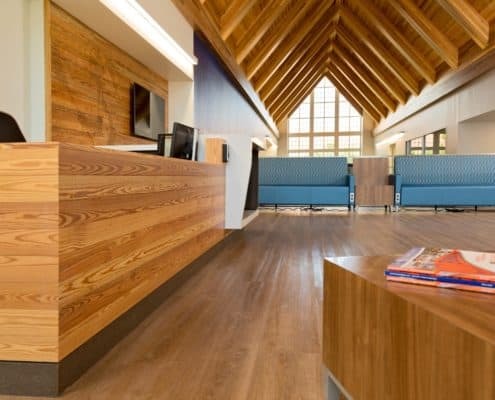 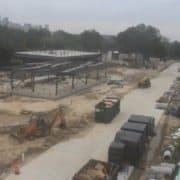 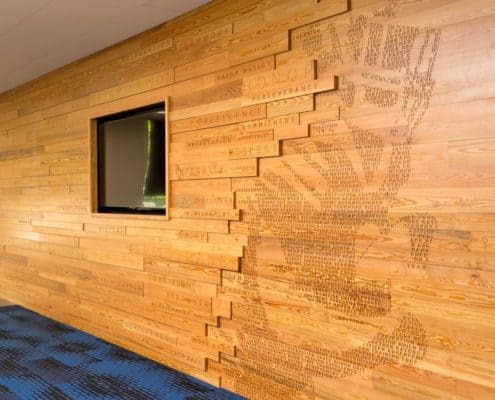 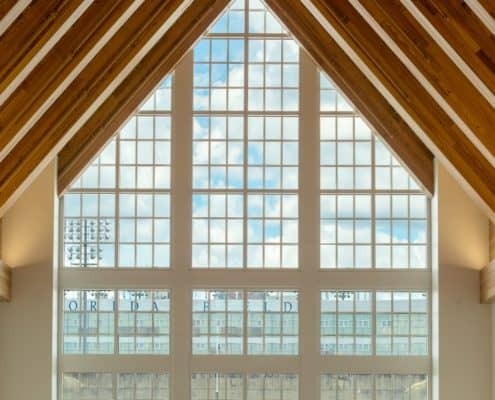 (Gainesville, FL) – Sustainable, River-Recovered® Heart Pine is the focal point of the University of Florida’s (UF) new, world-class, Otis Hawkins Center for Academic and Personal Excellence (Hawkins Center); designed to support and enhance the academic experiences of the university’s athletes. 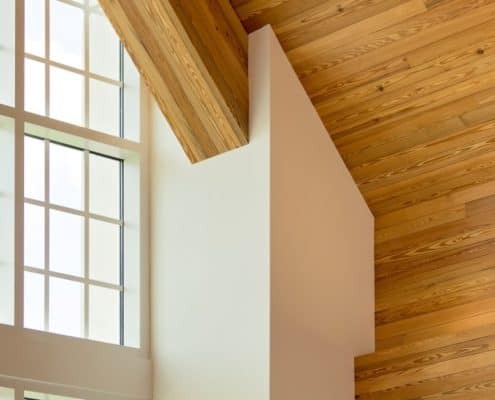 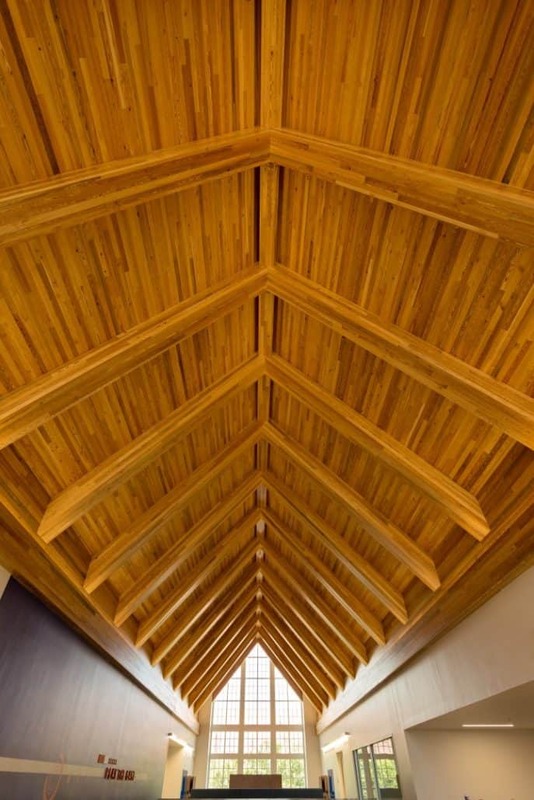 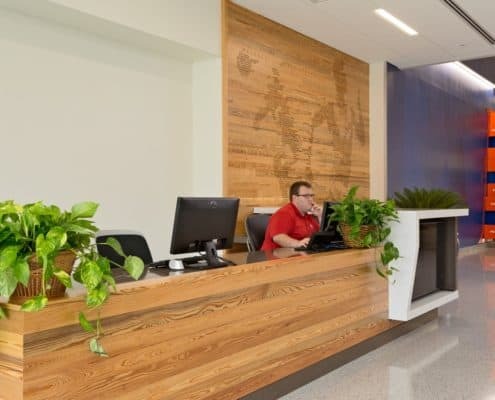 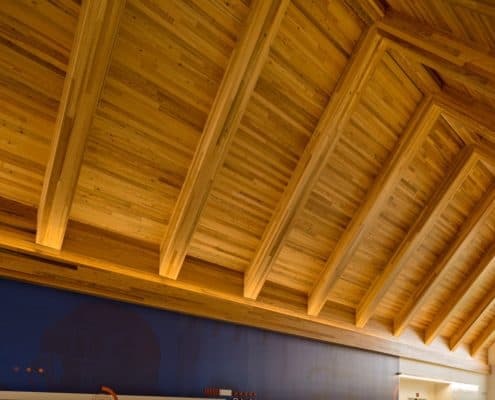 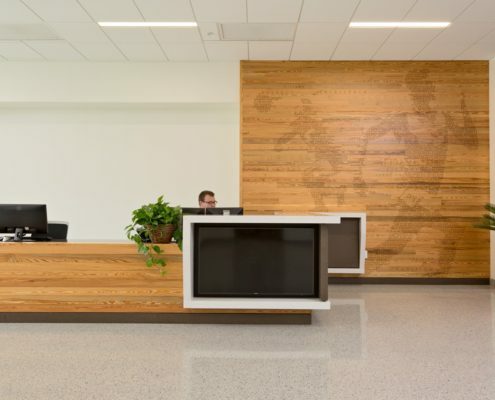 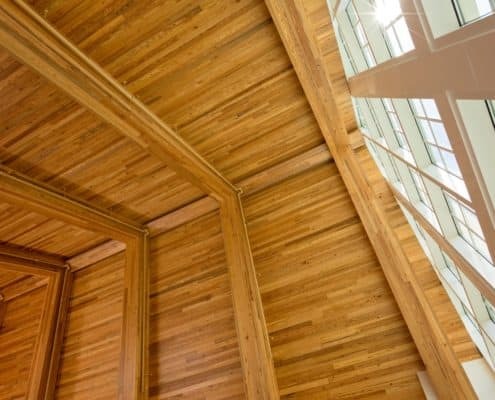 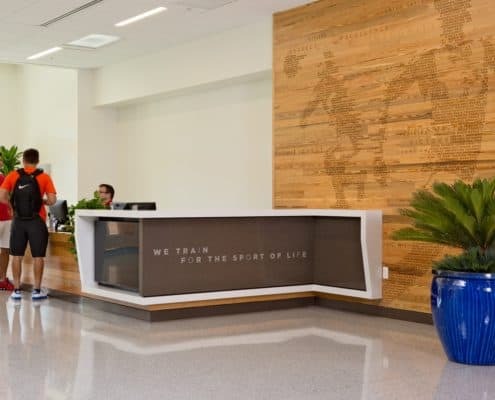 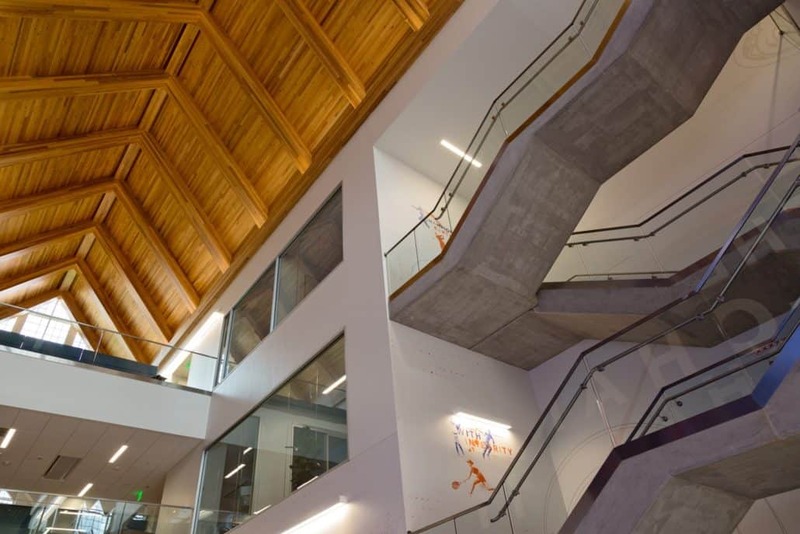 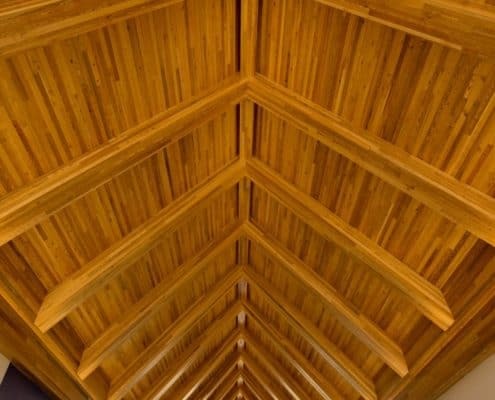 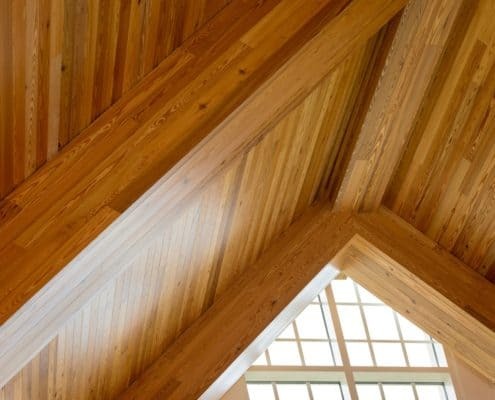 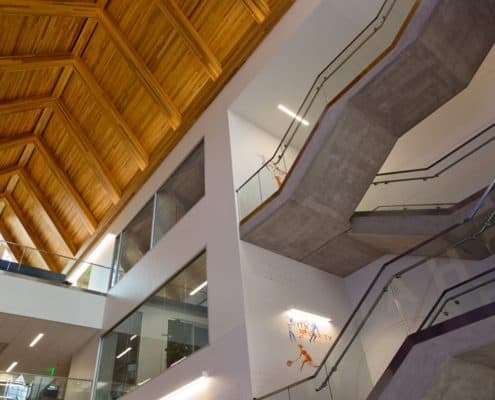 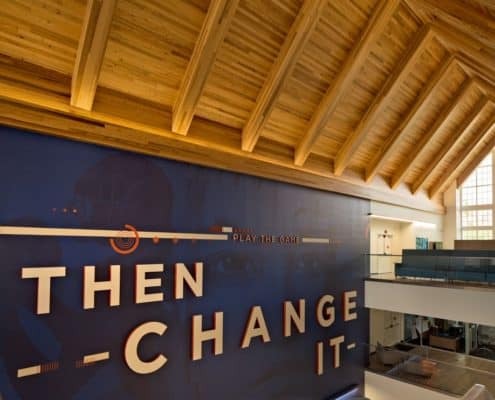 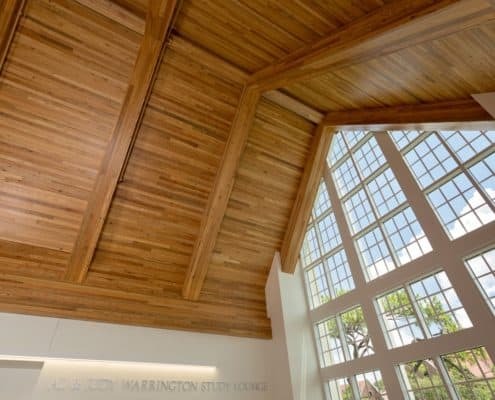 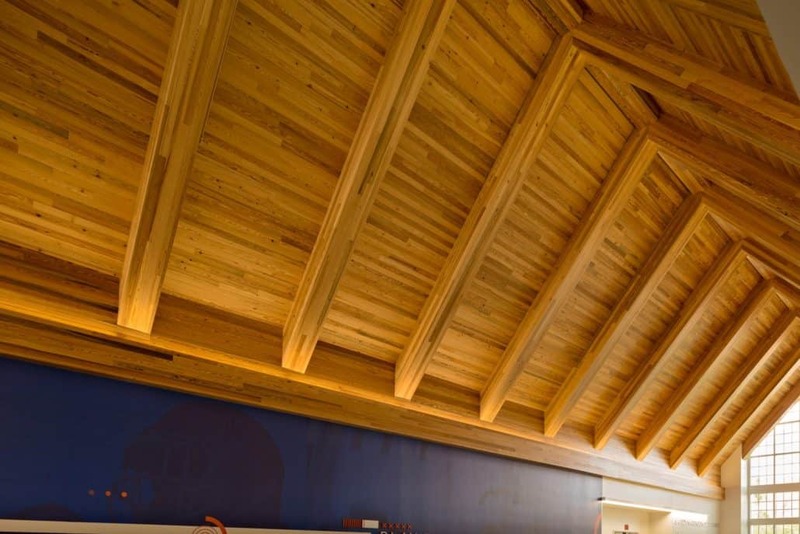 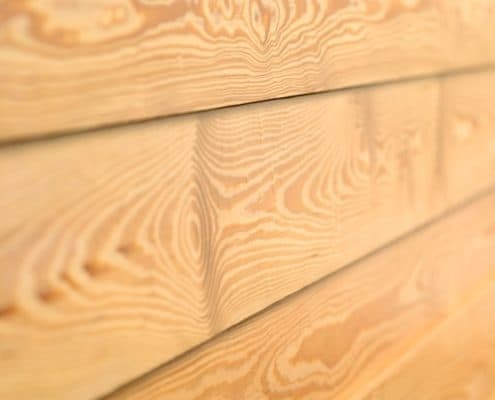 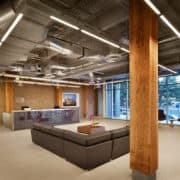 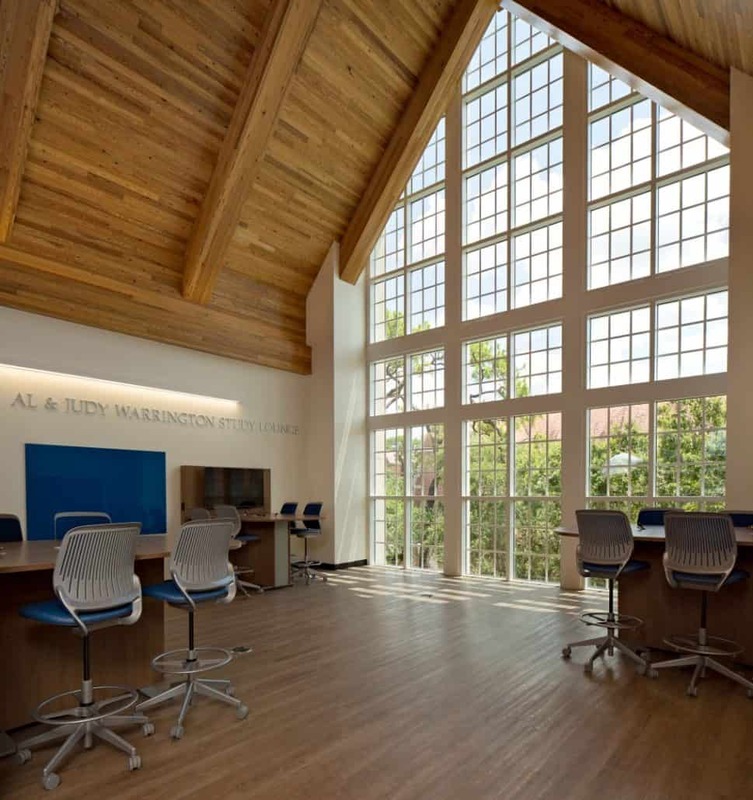 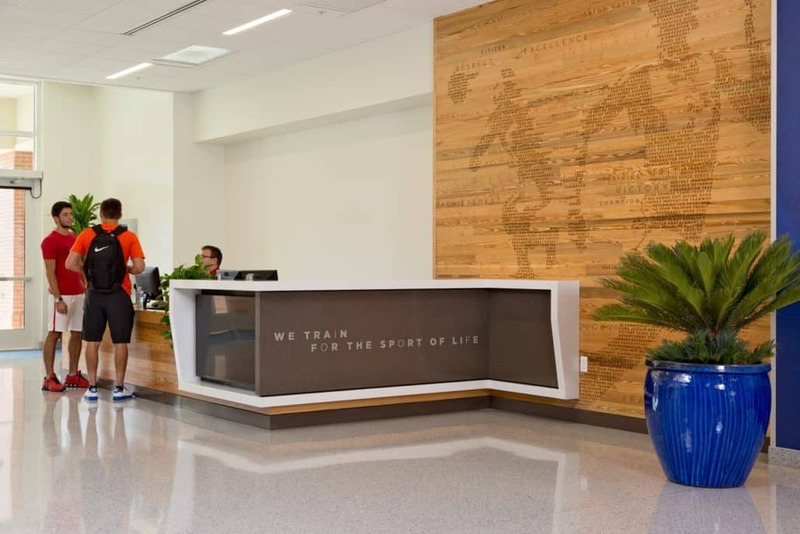 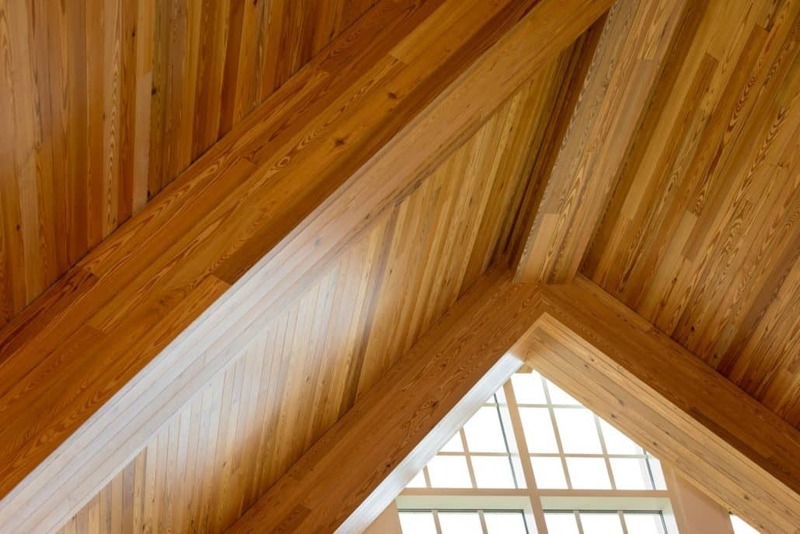 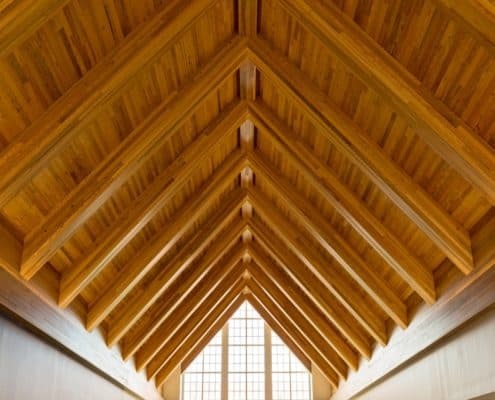 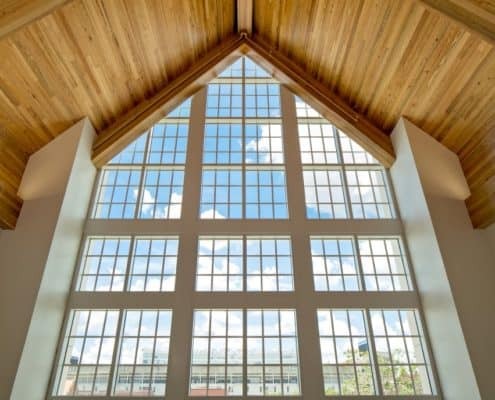 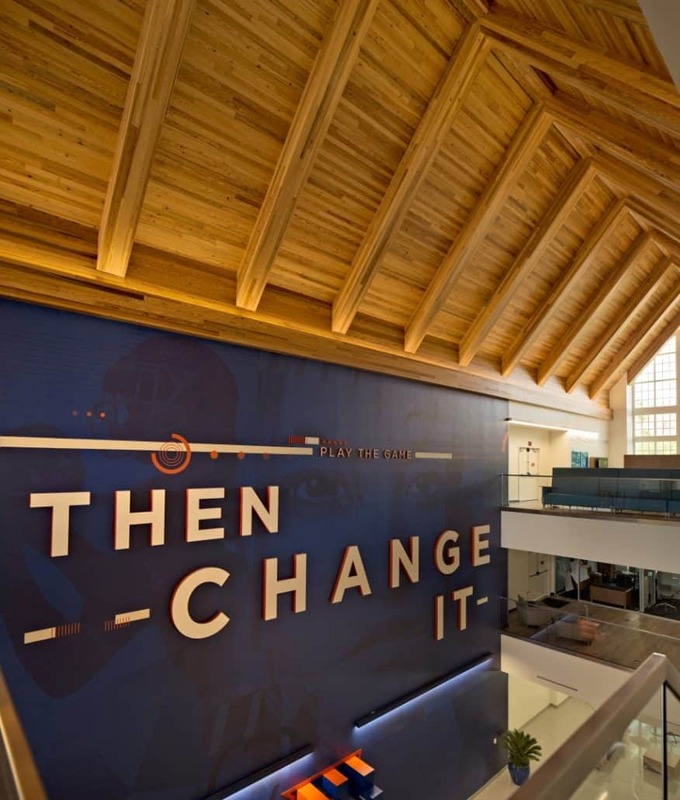 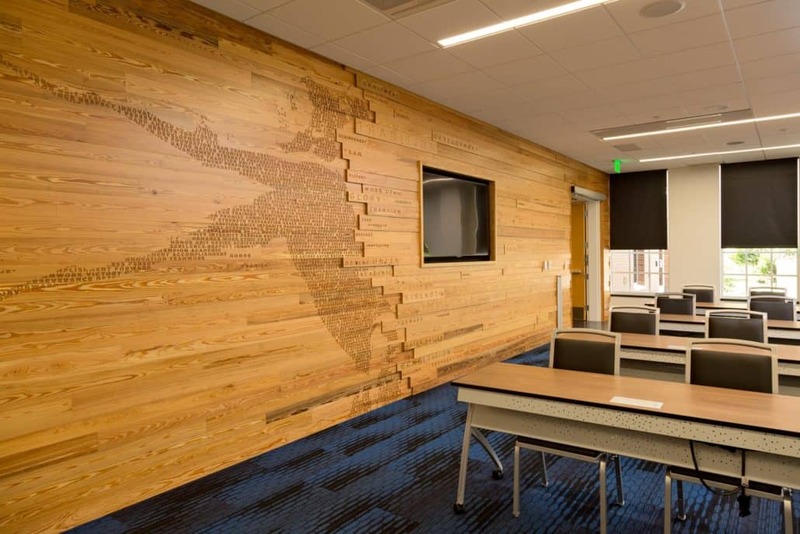 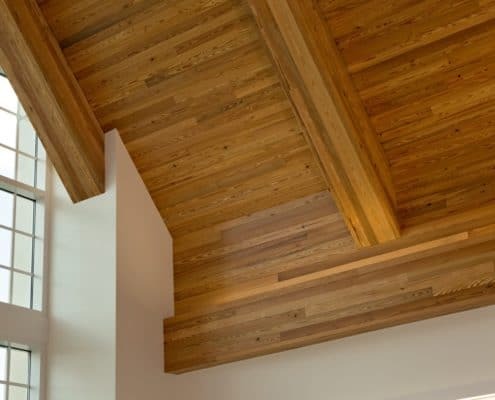 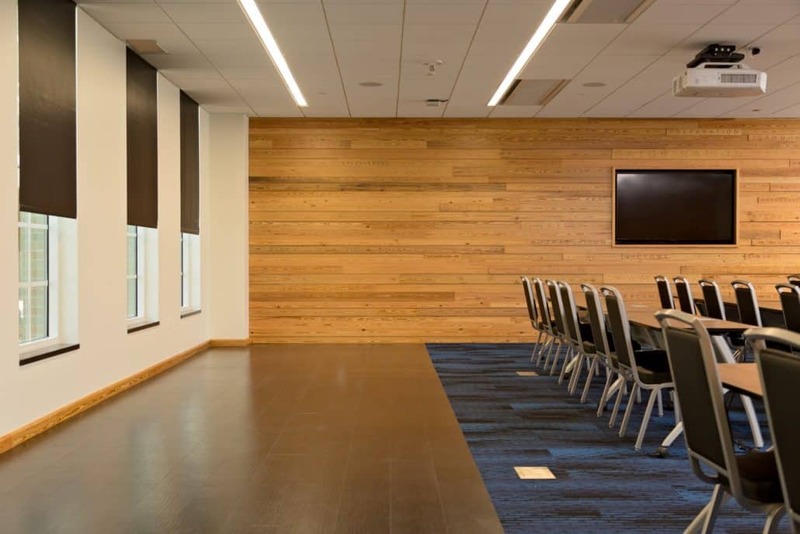 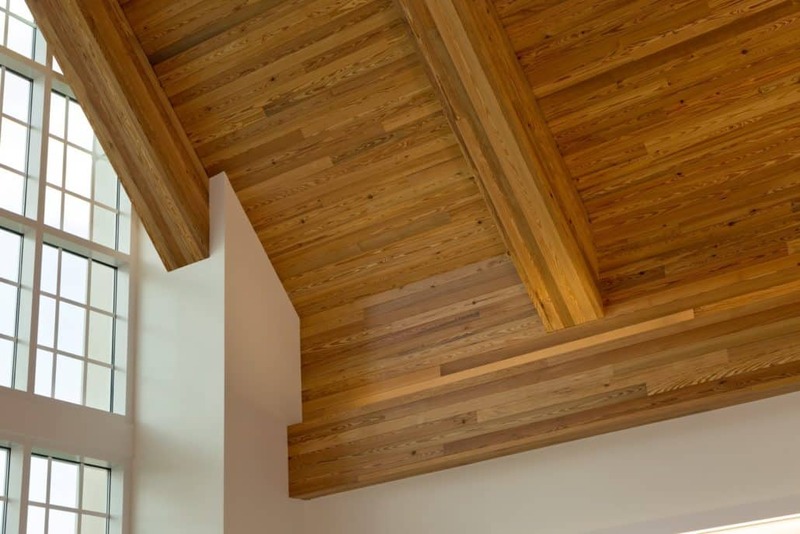 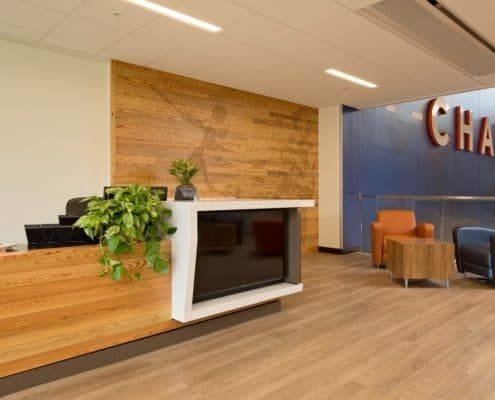 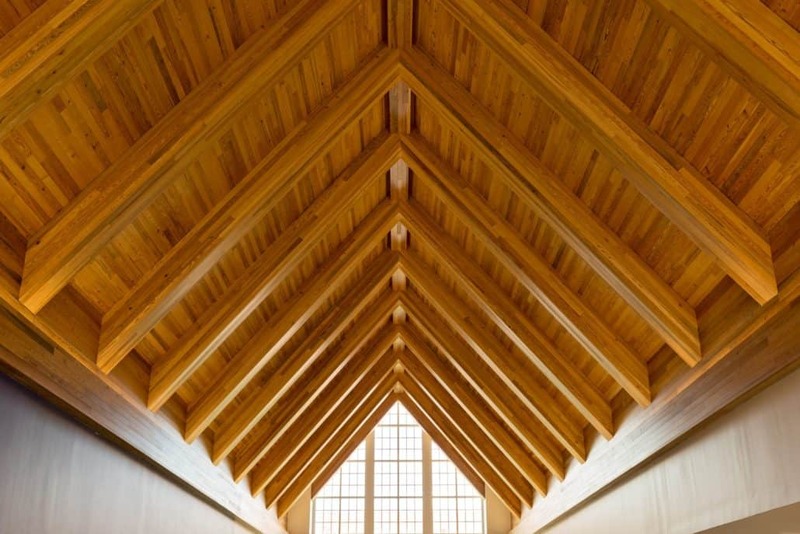 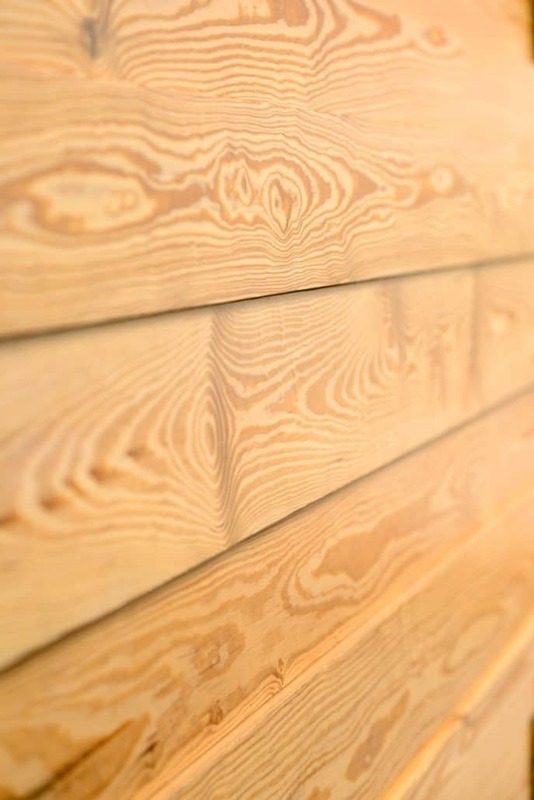 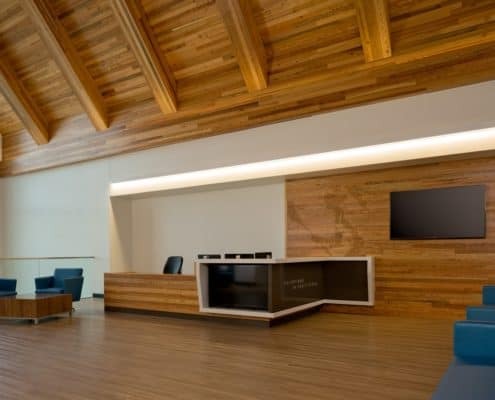 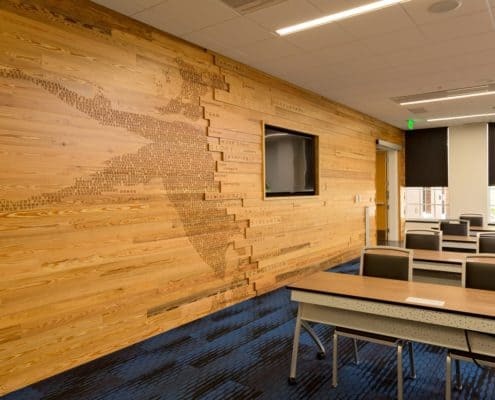 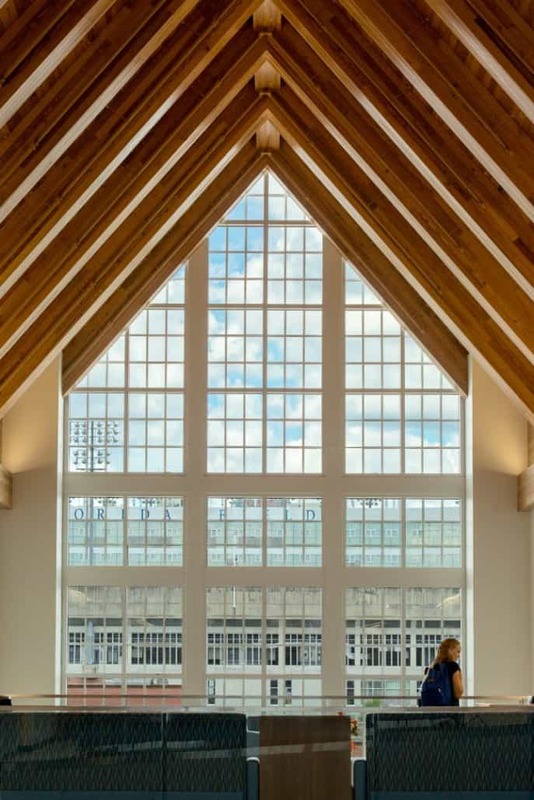 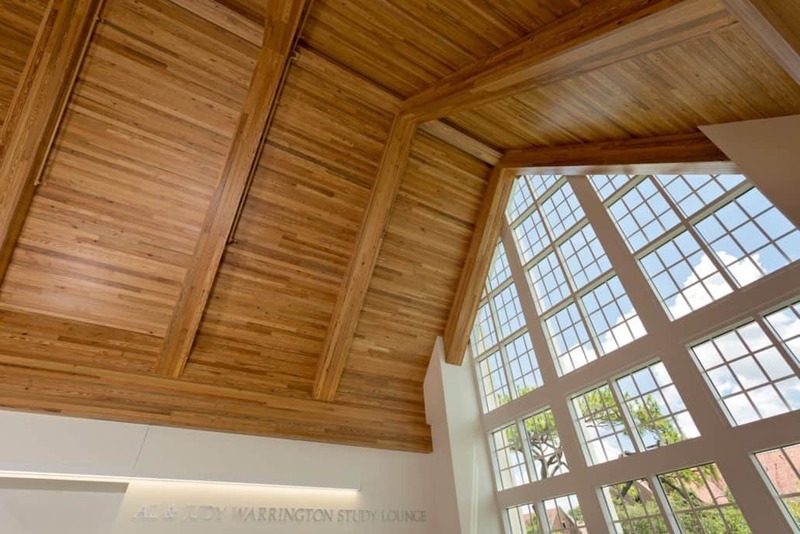 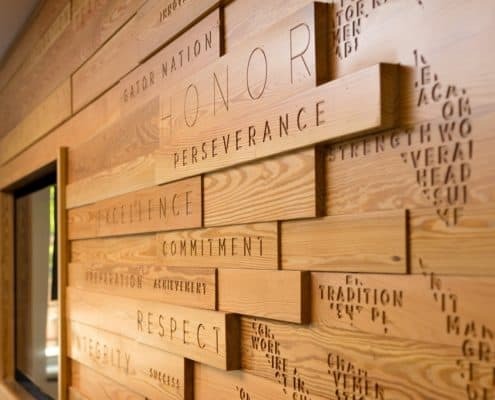 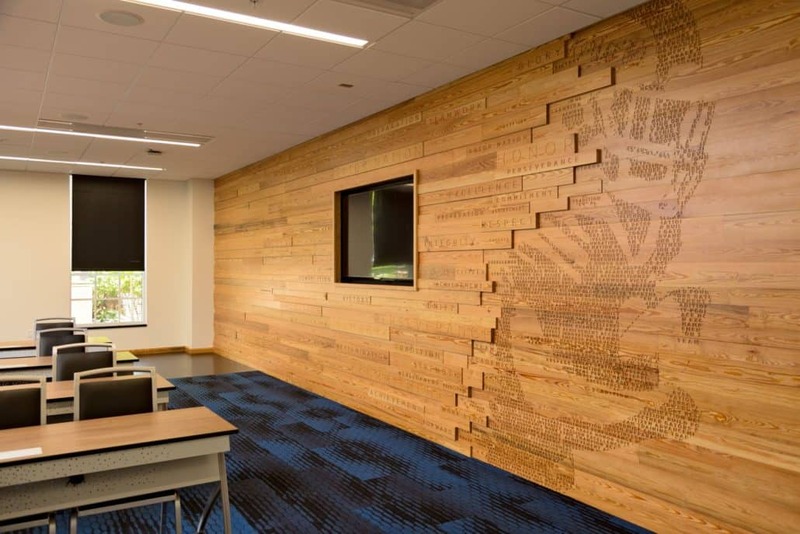 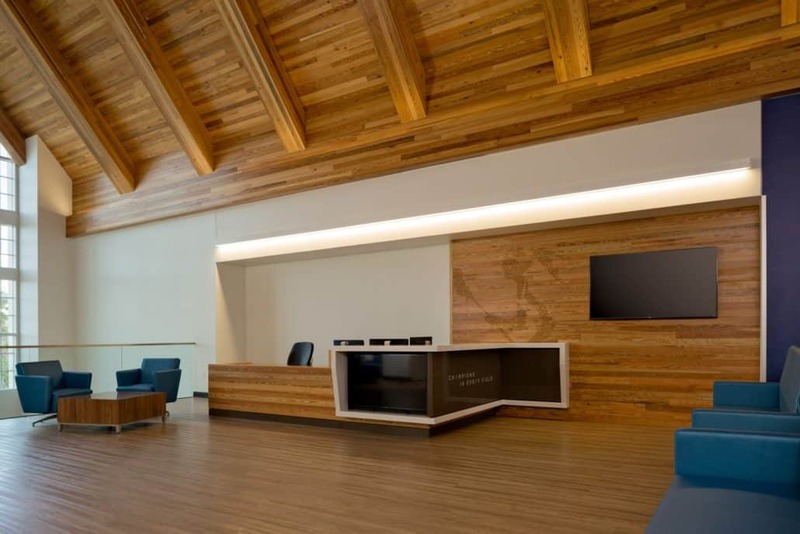 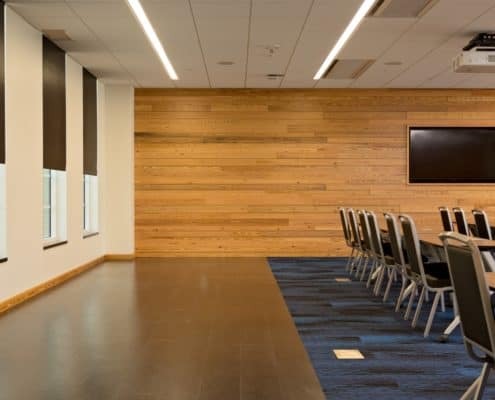 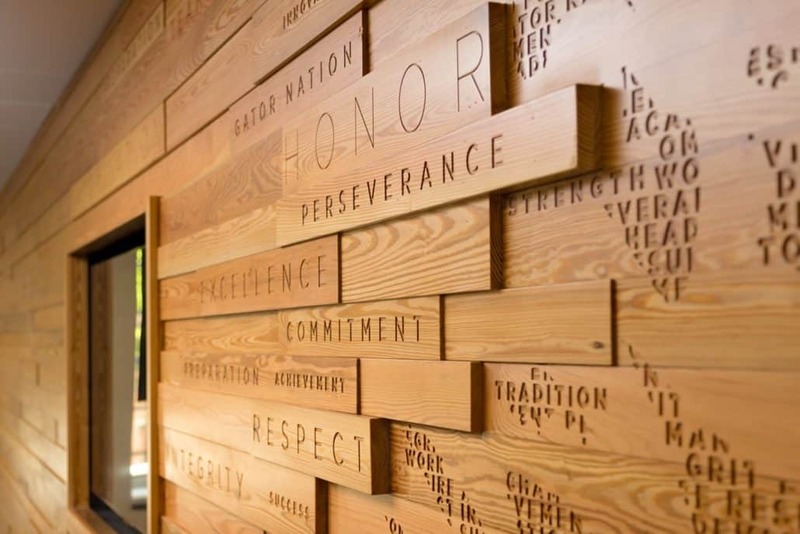 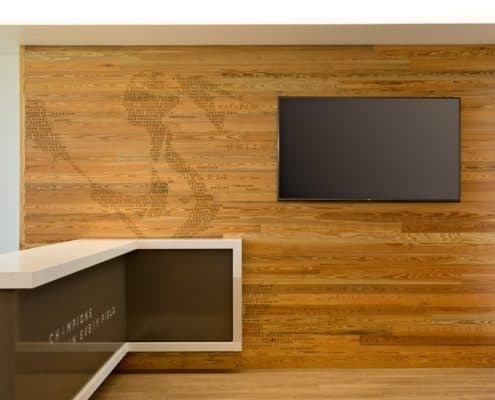 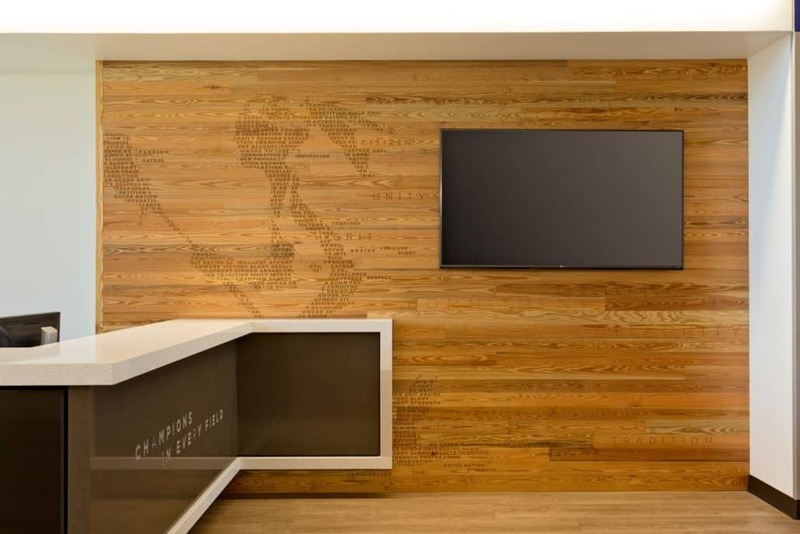 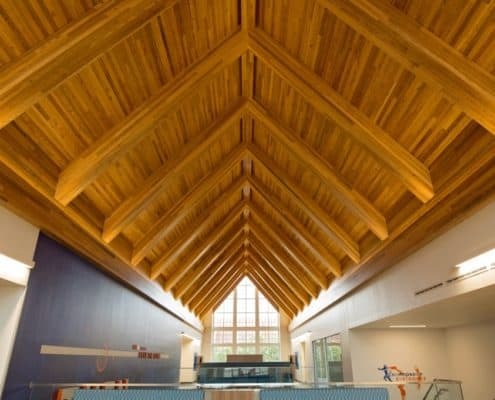 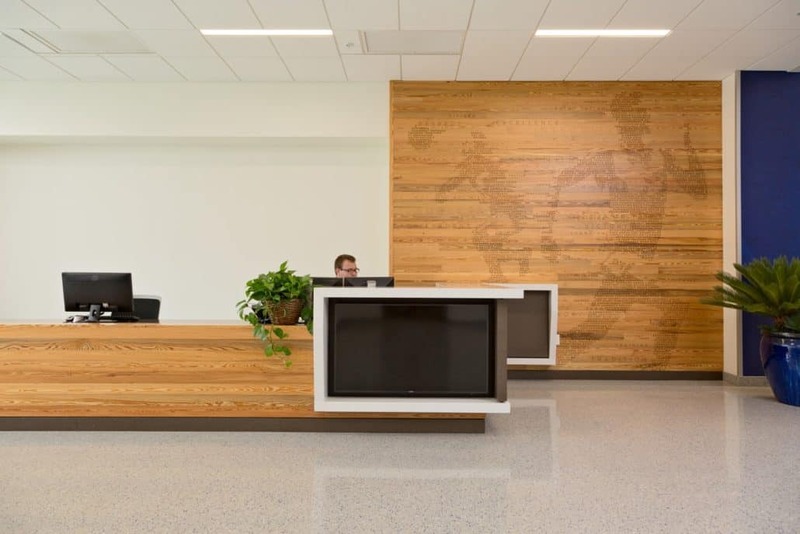 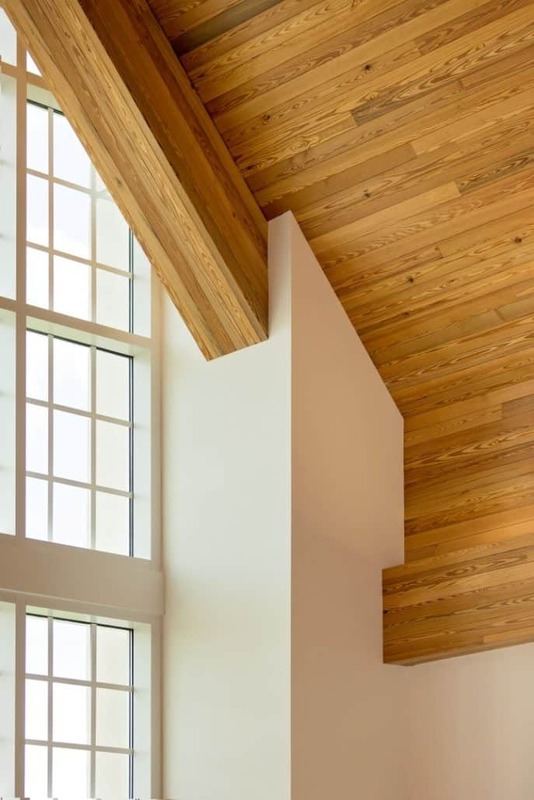 The wood – which encompasses 10,000 square feet of ceiling and wall paneling – was provided by Goodwin Company, pioneers of the River-Recovered® process. 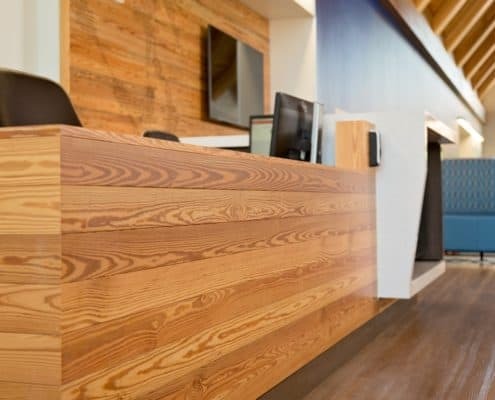 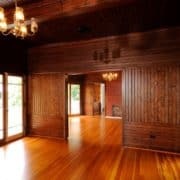 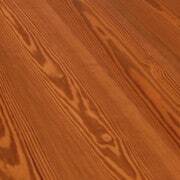 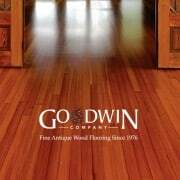 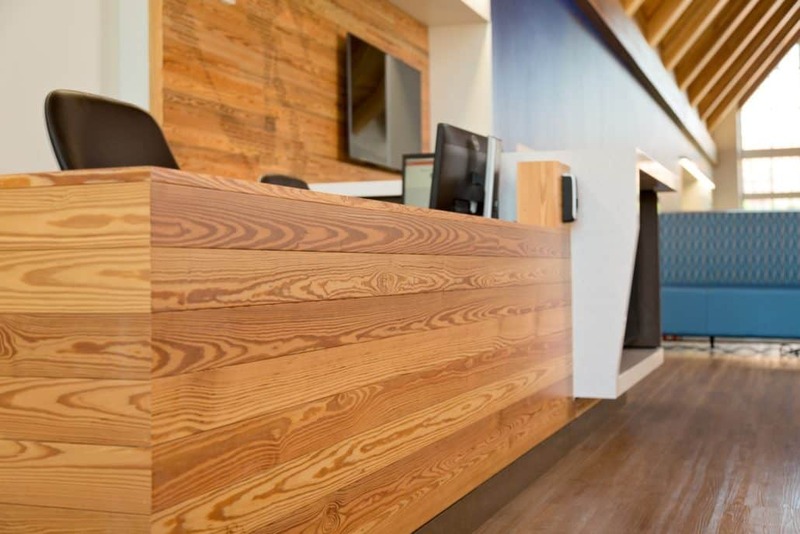 Goodwin recovers antique logs from river bottoms – where they have been perfectly preserved for hundreds of years – and mills them into arguably the most beautiful and sustainable wood flooring and paneling in the world. 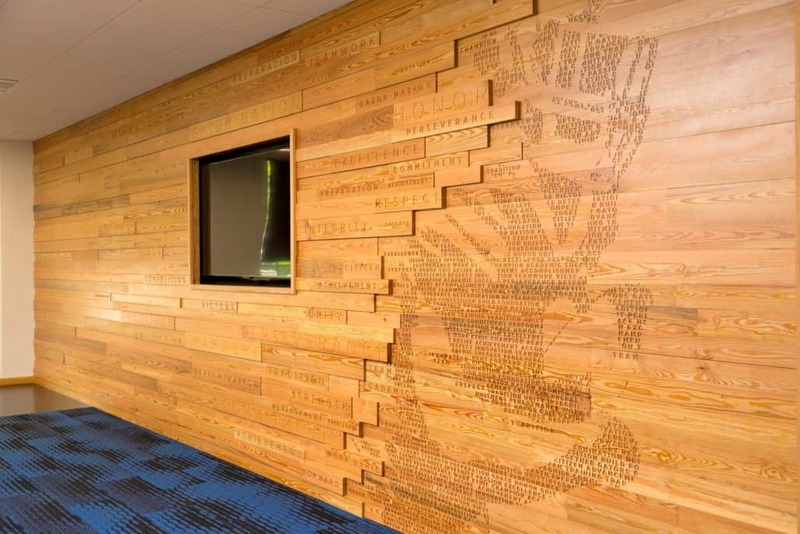 According to Chip Howard, Executive Associate Athletic Director for Internal Affairs, UF sits upon what once was a vast longleaf pine forest. 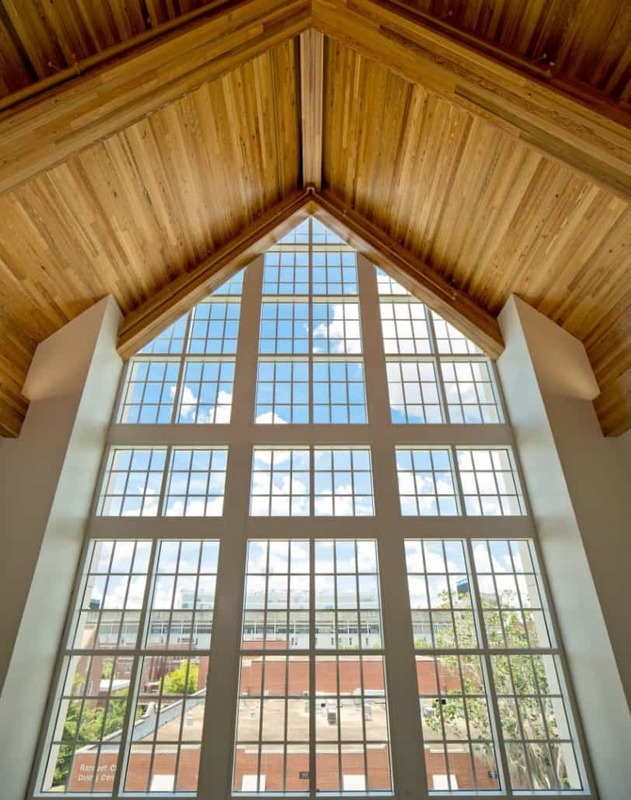 Longleaf is pinus palustris or “pine of the swamp.” UF Grounds Services uses many native species when planting and several of the new buildings on campus have added young longleaf pines into their landscapes. 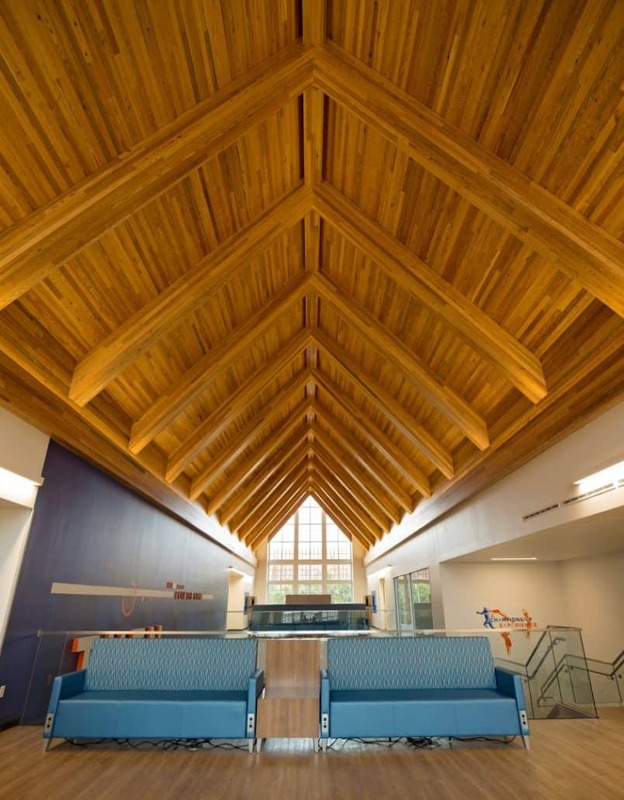 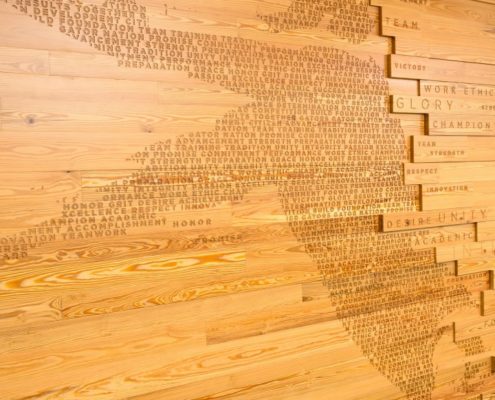 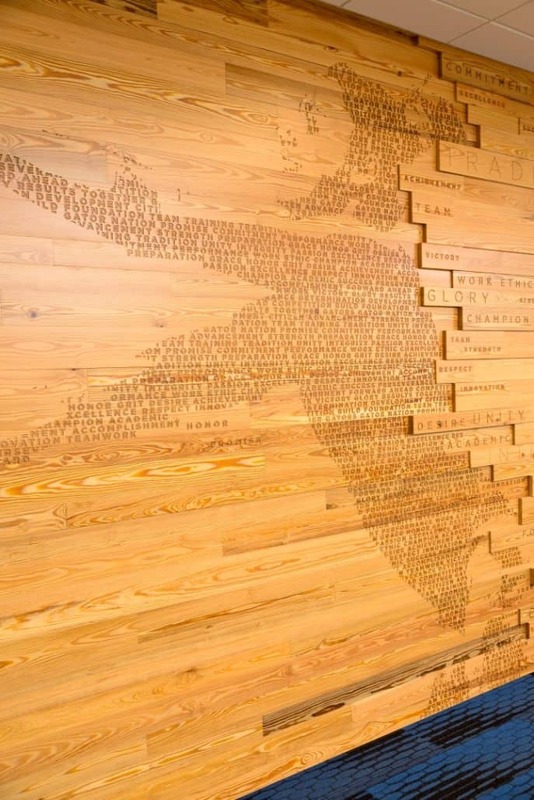 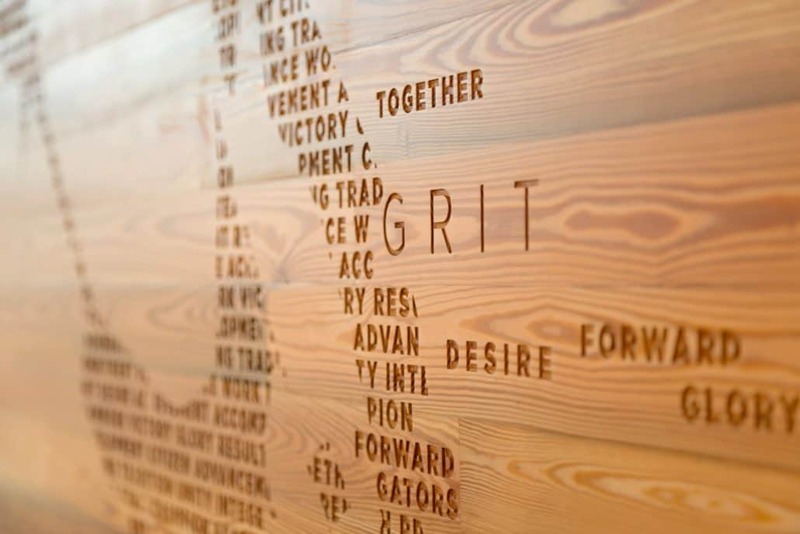 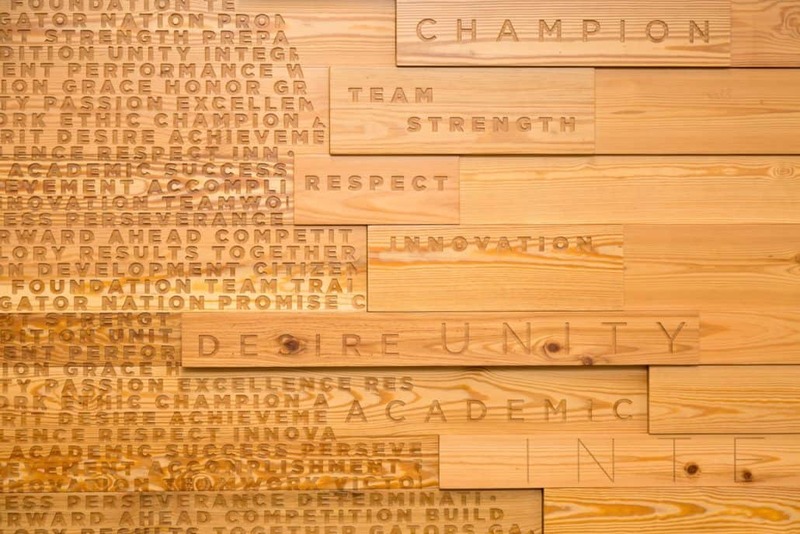 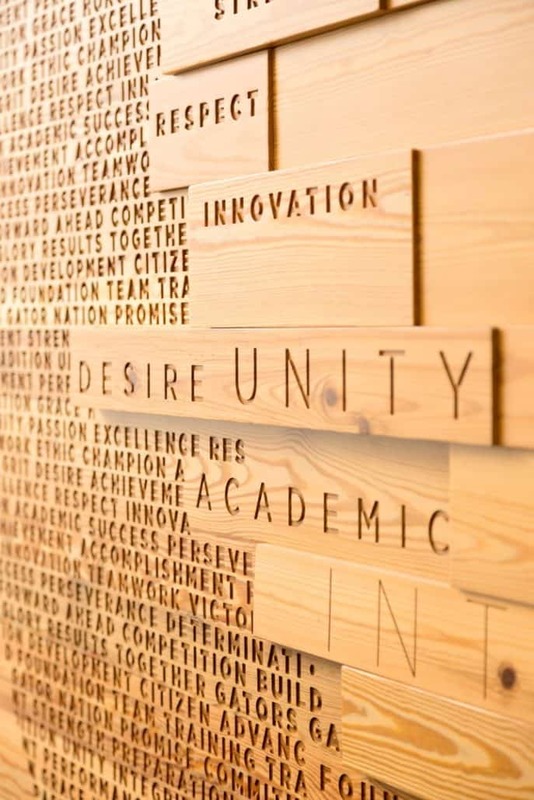 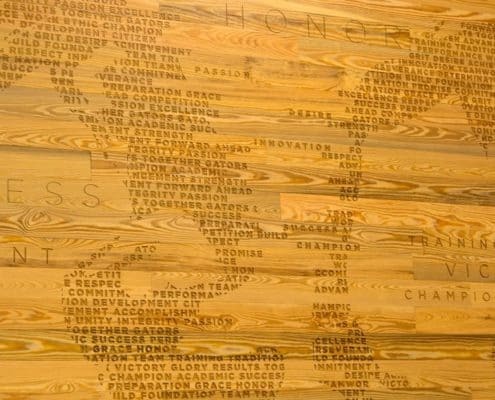 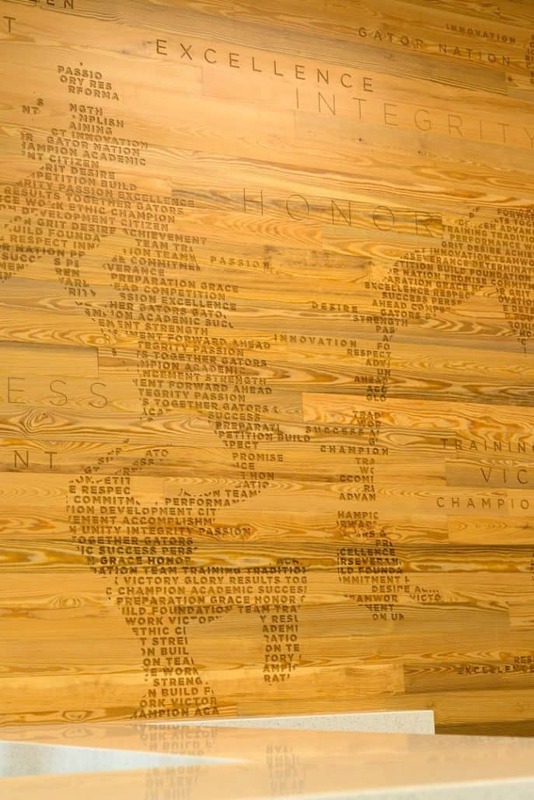 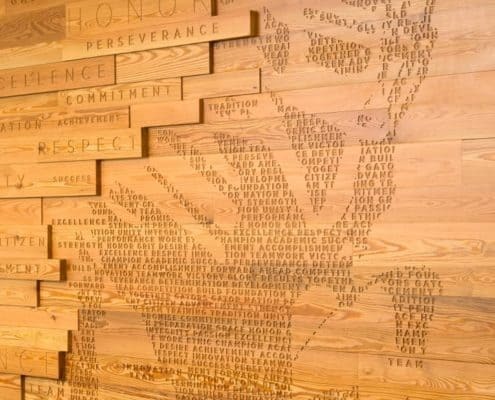 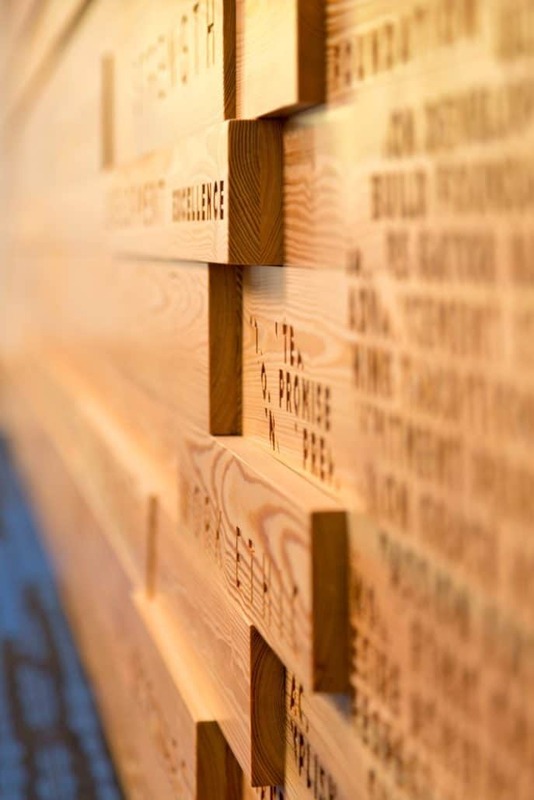 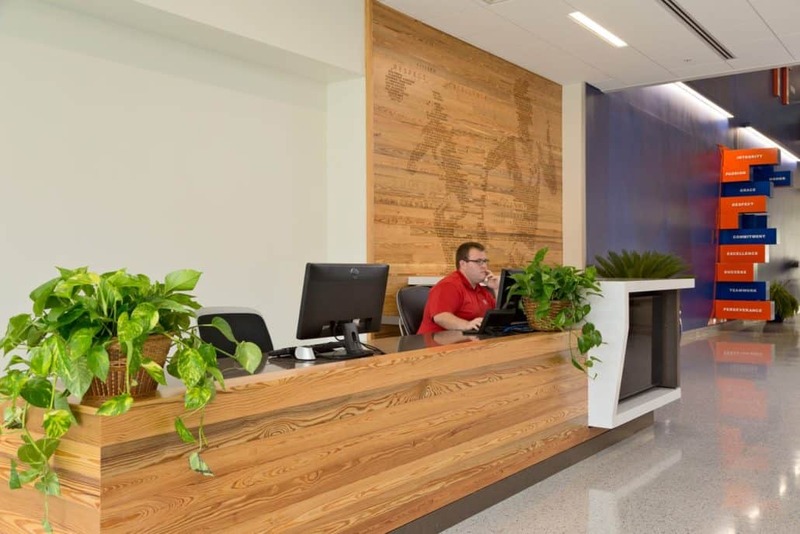 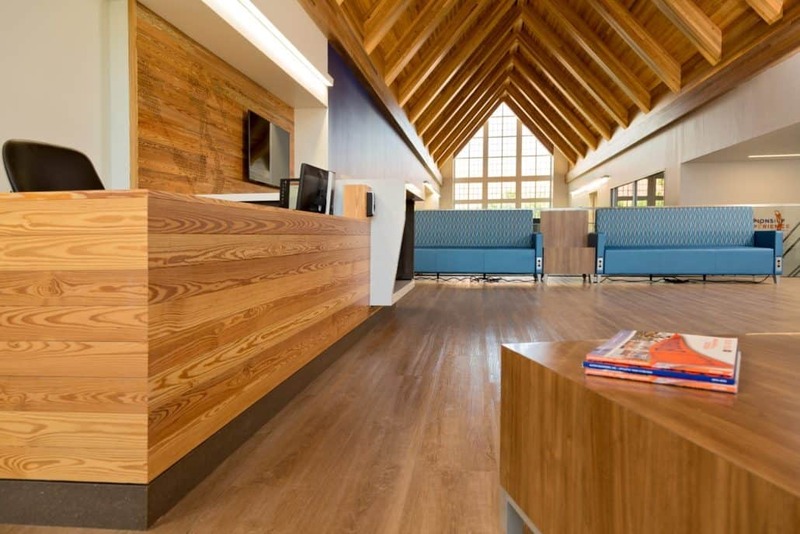 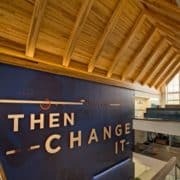 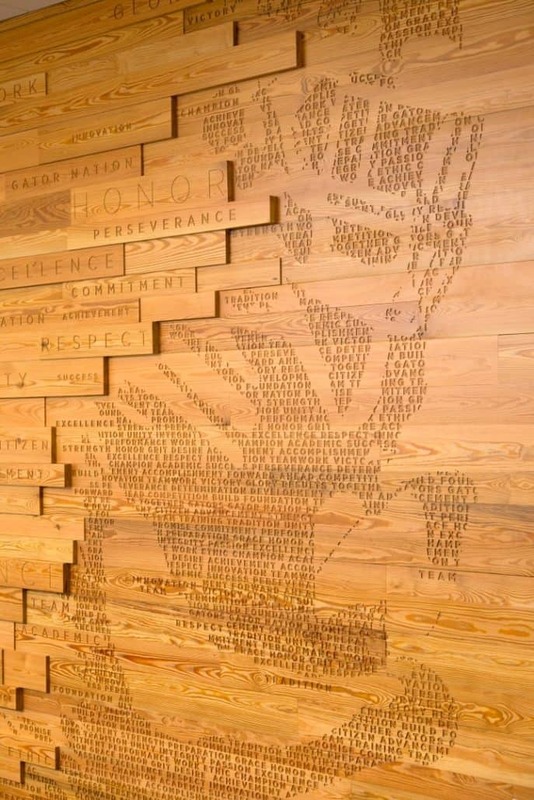 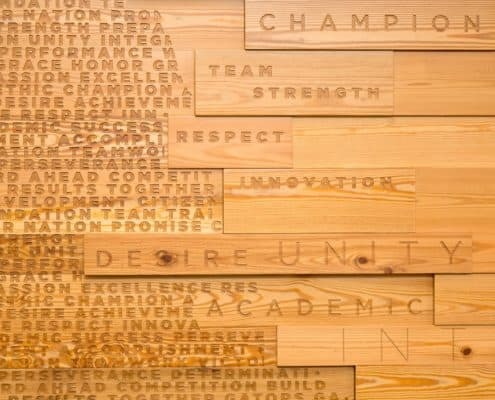 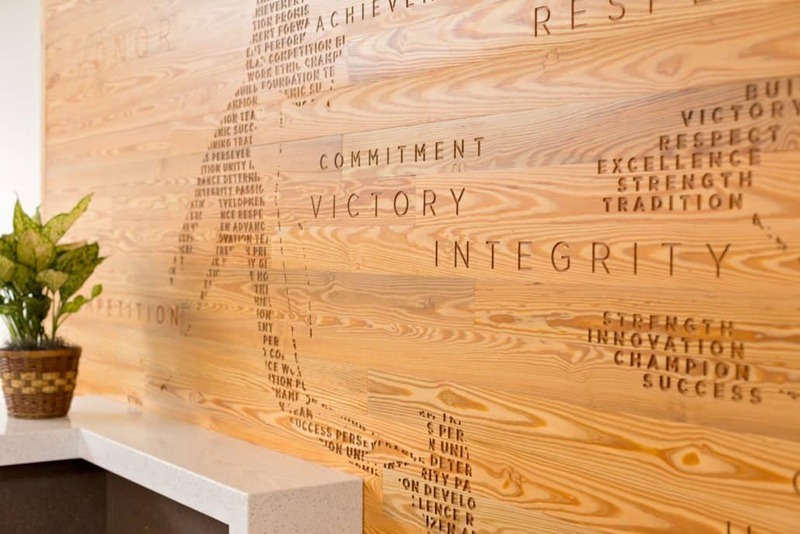 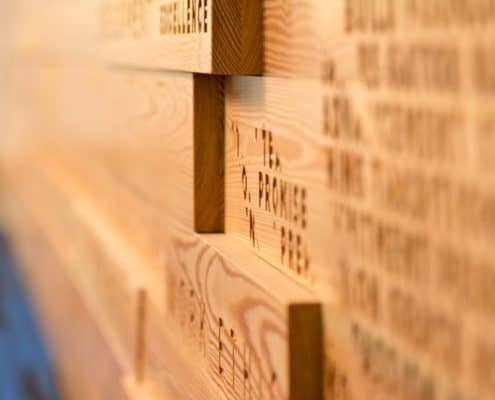 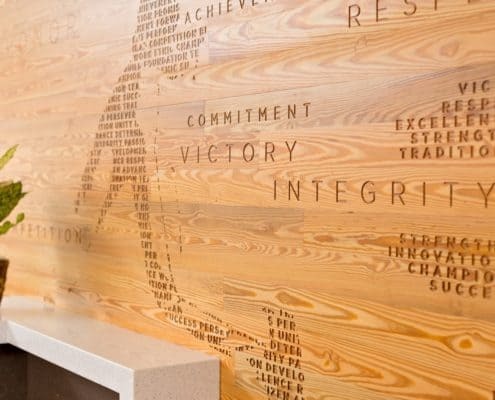 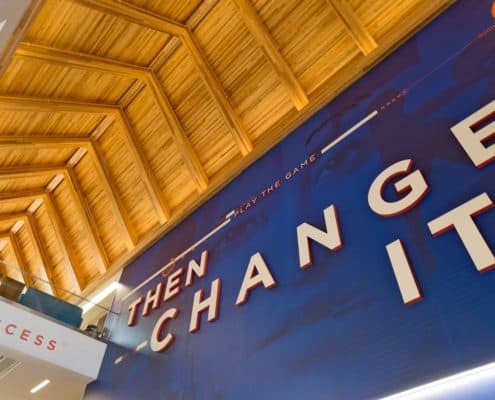 The incorporation of locally sourced antique heart pine in the Hawkins Center is a nod to the legacy and shared history between UF and that ancient longleaf forest. 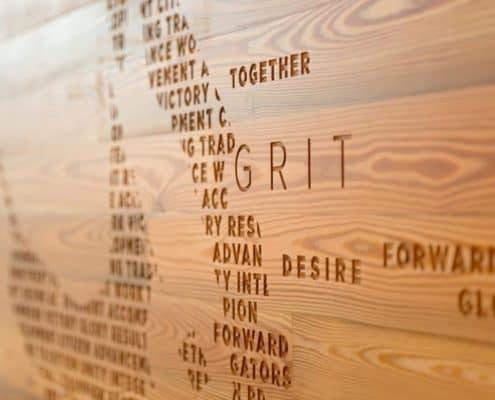 This is not the first time Goodwin’s wood has been used on the UF campus. 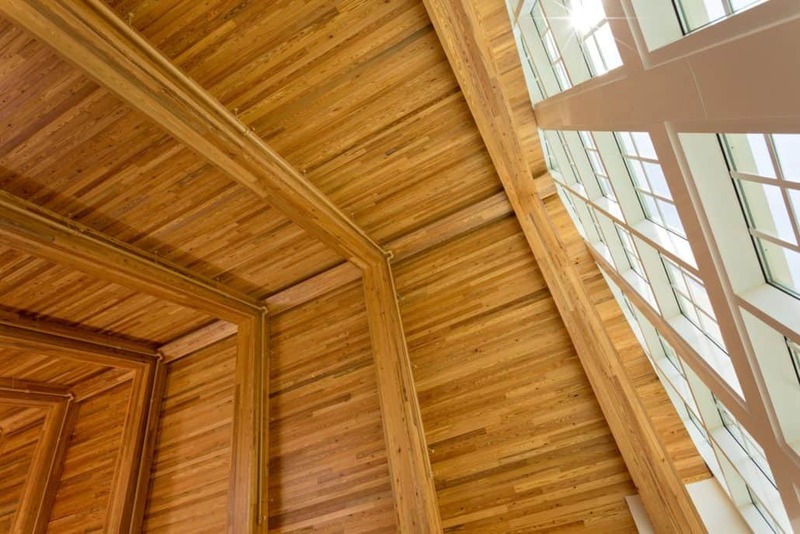 Last year, the company provided their River-Recovered® Vertical Heart Pine, Legacy® Heart Pine and Curly Heart Pine for use in the Dasburg House, home to UF President Kent Fuchs, Ph.D. Goodwin collaborated with an exemplary team of professionals on the Hawkins Center project, including Parrish-McCall Constructors Inc. (project builder), DR Nickelson & Co. (wood installer), Beverly Frank of Gould Evans Architects (specifier of the River-Recovered® Heart Pine) and Chip Howard and his staff. 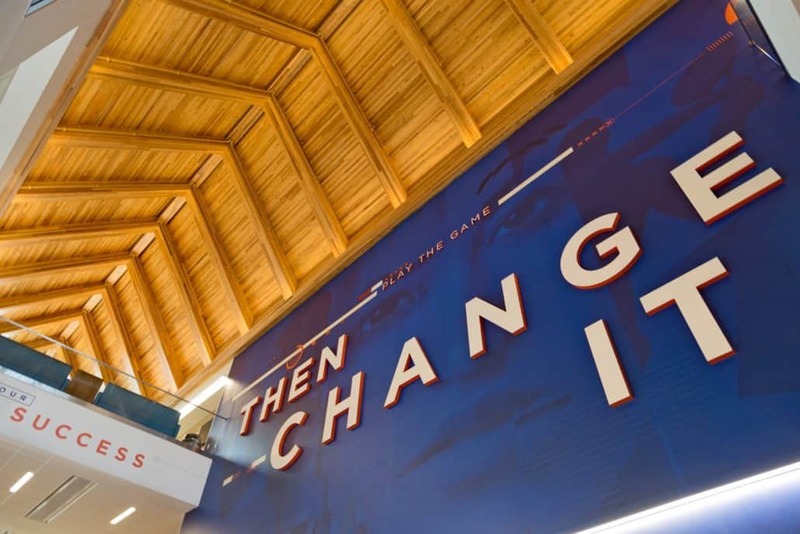 The 83,000 square foot Hawkins Center celebrated its official dedication on Monday, June 27, 2016. 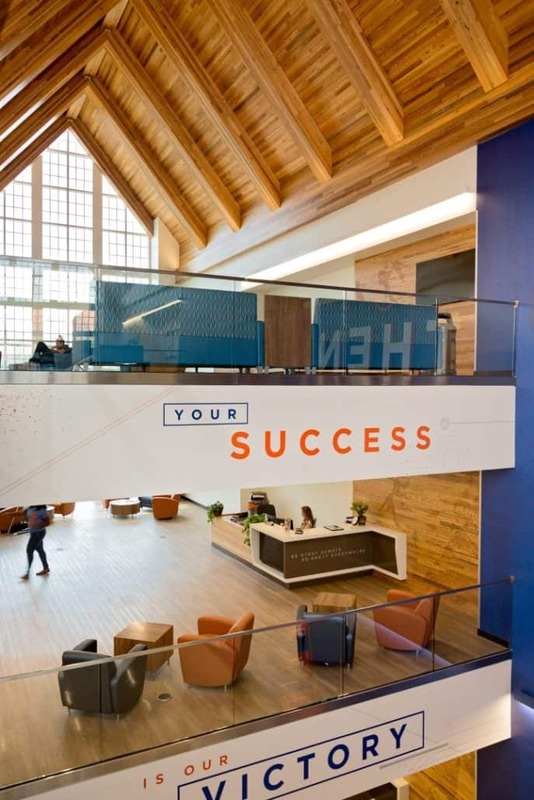 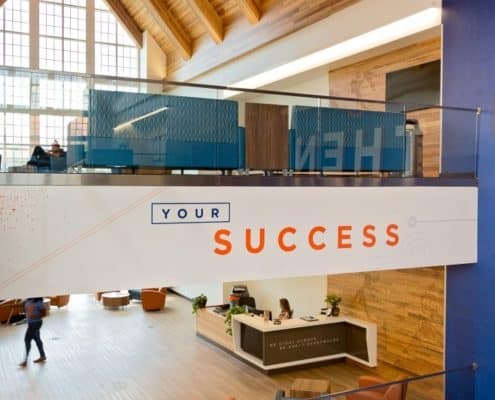 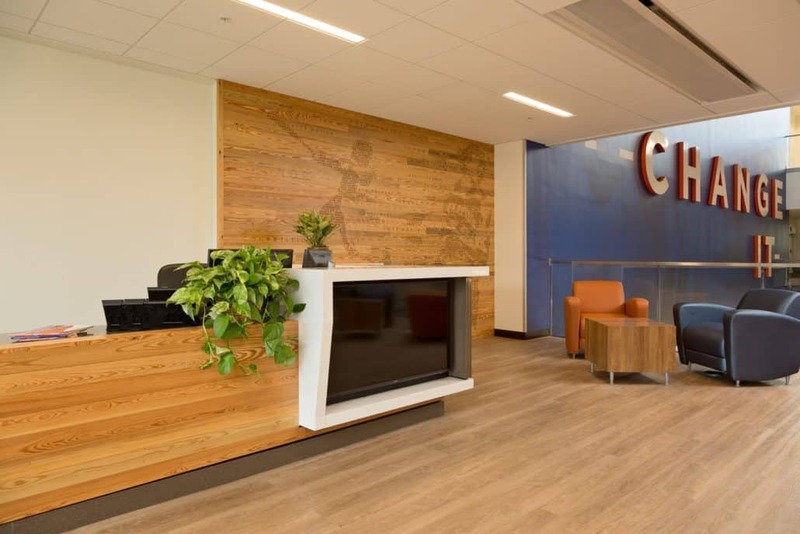 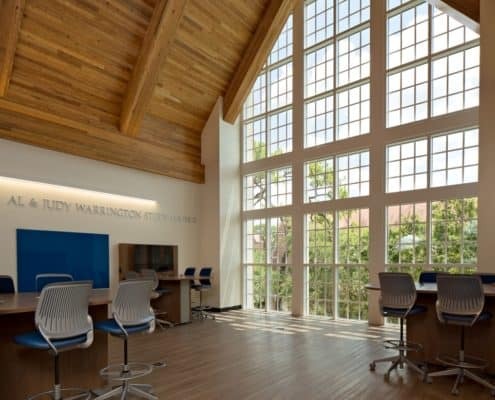 The center provides UF’s more than 480 student athletes with a study area along with tutoring, academic advising, nutrition, research, wellness, leadership, job placement and other services.